We’d love your help. Let us know what’s wrong with this preview of Hitleris. Paskutinė Diena by Jonathan Mayo. Hitleris. Paskutinė Diena: minutė po minutės. To ask other readers questions about Hitleris. Paskutinė Diena, please sign up. Although this is described as a minute by minute description of Hitler’s Last Day, in fact it is more than that. This book takes us through the day before his suicide Sunday 29th April and the his last day, Monday 30th April. However, it does so not only through the perspective of those in the bunker, but also through the diaries, letters, memoirs of other people throughout the world – from political leaders such as Churchill, Stalin and Harry Truman, to journalists such as Alan Whicker, prisone Although this is described as a minute by minute description of Hitler’s Last Day, in fact it is more than that. This book takes us through the day before his suicide Sunday 29th April and the his last day, Monday 30th April. However, it does so not only through the perspective of those in the bunker, but also through the diaries, letters, memoirs of other people throughout the world – from political leaders such as Churchill, Stalin and Harry Truman, to journalists such as Alan Whicker, prisoner’s in Burma and Europe, a mother awaiting the return of her POW son, William Joyce (Lord Haw-Haw) and a whole cast of other characters. Meanwhile, the bodies of Benito Mussolini and his mistress are unceremoniously dumped, after being killed the day before. Magda Goebbels plans the murder of her six young children; Helga, Hilde, Helmut, Holde, Hedda and Heide. British medical students are sent to Belsen, other troops are busy liberating other concentration camps and prisoner of war camps, food supplies are dropped to the Dutch and the war in Europe begins to conclude as Hitler plans his suicide. This really is a fascinating, if often difficult read. However, amongst the horror there is humour – an aide discovers Churchill has set himself alight while smoking in bed (the more I read about Churchill, the more I admire him), Captain Sigismund Payne-Best outwits his German captors and saves his fellow prisoners, and others realise that the war is finally over for them. It is hard to say that I enjoyed this book, because of the subject matter, although I certainly did. The authors have done a wonderful job in re-creating this time, so that, even though you know the bare facts of what will happen, there is a real sense of urgency and pathos to many of the scenes. Many in the bunker are trying to think of their own escape routes and the end of the book tells you what happened to all the characters mentioned – including young secretary, Traudl Junge, Hitler’s chauffeur, Erich Kempica and his valet, Heinz Linge. This is a good reconstruction of the end of Hitler’s war, and his life, and the detail is excellent. It reads more like a thriller than a dry history, but the factual content is simply very well told. Well, this is not exactly the LAST DAY of Hitler, rather an hourly report of the last two days of the man and those he was in company with. But the report includes a timely inclusion of world events, which, somehow, relate to the great event: WWII. So it’s a (debatable) account of those fatidic days of 28th and 29th of April 1945, inside a bunker. Right from the start of the book, you can get an appreciation of the forces heading towards Berlin. Those military forces are depicted in an elucidating map: the 4th and the 12th German Army heading towards the center,…the soviets from the north and east, and the Americans closing in from the west. Berlin besieged. The list of characters is huge; it includes names from several camps: Americans, Dutch, Japanese, Russians etc etc. I would concentrate on those two days and the behavior of Hitler and those close to him. On those last days he had meals only with the women in the bunker and was convinced he would never be captured by the enemy. Eva Braun wanted a beautiful cadaver, so she thought of poison; yet Hitler deemed his “best” way would be a “shot in the head”. On the 29th April he was saying: “time has come Fräulein Braun”. He had envisioned “this afternoon” [15:30 p.m.] to be the end of their lives. The Russians then arrived. Yelena Rzhevskay, an information officer, reported what the first Russians saw on the 2nd May in the Chancellery: bodies burned (with gasoline), and also the dead children (lying in bed) of the Goebbels couple; both dead too. 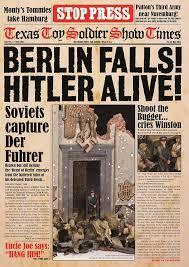 It is said that Stalin refused, for some time, accepting the death of the German leader. Stalin wanted a sort of drama-trial. 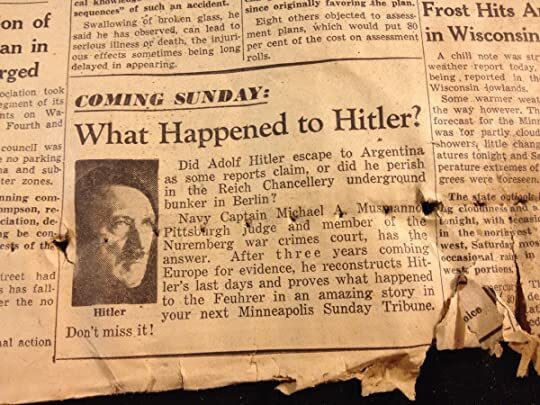 It circulated the story that Hitler had escaped. Only in the Potsdam Conference things got clarified, by the account of Truman, and the (so called) corroboration of the “dental records”. To me there are still many loose lines/ends, and you can always wonder. The corpses were discovered by Nazi members Bormann, Heinz and Linge; one saying he “avoided” looking at the faces. One could always raise doubts on this narrative. It’s reported, that on the 16th of July 1945, W. Churchill visited the bunker. After witnessing the inside-mess,…as he left, he said something like: had England lost the war that would have happened to them (the British). Just a curiosity I got to know on Churchill: he would like to work in bed. The book has a quite detailed context, as I said, of other significant parallel happenings worldwide: in Burma (“the japs are gone"), in Amsterdam, in America…., even Richard Strauss playing somewhere, ….which give more meaning to that central story: Hitler’s final days. His final days but also the crumbling of his project …and, regrettably, of a whole nation. He played his part. Regrettably, to this day, things did not end, regarding Hitler’s ideology. Still, there are many today wondering about his whereabouts. Check also the books by Harry Cooper. Harry Cooper’s search has been for long, with several trips to Argentina. He claims having been in places (namely in Bariloche and Cordoba) where Hitler lived. People there (Cordoba) were familiar with the facts, also about other Nazis like Eichmann, and Mengele …, having been there too. But the approach of Cooper and others put the whole story into a new perspective/frame. It implies a deal between the Americans and the Nazis: German technology (which the Americans didn’t want to fall into Russian hands) for helping thousands of Nazis getting into South America. Some testify having seen a “ (drugged) Hitler forcibly moved from the bunker” . Henry Ford may have had some reason when affirming “History is bunk”. Ah, 20 facts you may not know about Adolf Hitler, like Ghandi writing a letter to Hitler,.....ENJOY! The book covers not only the last day of Hitler's life but guides the reader throught years well before WW2. A good book for those who would like to learn something about the tyrant and the mechanism behind his dark power. Well, I confess, I quit this book nearly halfway through. I'm a sucker for the apocalypse days in Berlin, and I was hoping to learn something new about the last moments in the bunker. However, the title is totally, absolutely misleading. To begin with it doesn't describe the last day, but mostly the last two days. But it could be forgiven for that. What I could not forgive is that the book is NOT about Hitler but about anything and everything the author could think of throwing in there - from the Well, I confess, I quit this book nearly halfway through. What I could not forgive is that the book is NOT about Hitler but about anything and everything the author could think of throwing in there - from the histories and bios of persons in the bunker to stories as far away as... Japan (seriously). In fact, probably most of the text, in italics no less, is side stories. This poses an additional problem because the bunker narrative is constantly broken and you just can't get into the story. Obviously, Mayo felt he had to do that because of the dearth of any (original) material, so he confines himself to repeating what has been said elsewhere (and much better) with a healthy dressing of page filler passages. Whilst the title of this book is rather misleading, it really should be called the 'Final 48 Hours of World War Two', this is something I can forgive as I did thoroughly enjoy it. I was expect to read an entirely different book and for it to be solely around Hitler's last moments, I did like the fact that I could find out more about the events happening around the world at that time. The book features a lot of passages from people who was there at the time from memoirs and eye witness accounts a Whilst the title of this book is rather misleading, it really should be called the 'Final 48 Hours of World War Two', this is something I can forgive as I did thoroughly enjoy it. I was expect to read an entirely different book and for it to be solely around Hitler's last moments, I did like the fact that I could find out more about the events happening around the world at that time. The book features a lot of passages from people who was there at the time from memoirs and eye witness accounts and this gave it a really nice touch to understand what everyone was feeling at the time including the German soldiers who were stationed in Berlin at the time. Whilst I believe, everyone should have knowledge of the monstrosities that the world saw during Hitler's rein, I would only recommend this book to people who have a special interest in war history as parts of the book could seem rather dry but as a history fanatic, I was thoroughly pleased with the detail that I got to read. It was also very interested to read what happened to the people in the book after the war was over. I thought that this brought another dimension to the book and was one of the reasons I have rated it 5 stars. Gripping from start to finish. Fascinating historical record. I found it hard to put down. You know the outcome but the details of how you get there are remarkable. I have to admit that I have had this on my TBR (To Be Read) Pile for a over year. When I first heard of this book on the History Hit Podcast, I then luckily found it on sale that same week but due to my lack of reading mojo at the time it has unfortunately gathered a bit of dust whilst laying on my shelf up until now. Even though by the cover and back of the book, I anticipated most of the content to be all about Hitler, the reality is anything but. We do get a timeline of events of not just Hitl I have to admit that I have had this on my TBR (To Be Read) Pile for a over year. When I first heard of this book on the History Hit Podcast, I then luckily found it on sale that same week but due to my lack of reading mojo at the time it has unfortunately gathered a bit of dust whilst laying on my shelf up until now. Even though by the cover and back of the book, I anticipated most of the content to be all about Hitler, the reality is anything but. We do get a timeline of events of not just Hitler but all of the people down in the bunker on that day and the build up to the Fuhrer's demise. I was not aware of much detail about this period before starting the book and I am aware that some of the information is fairly well known, yet I found the parts about Eva Braun and her conversations down in the bunker particularly interesting and informative. Despite my initial draw to the book, I recognised early on that Hitler was not the main focus of the book, but it was more so the impact of the ending of the war. The book is fast paced, yet beautifully woven, which encapsulates the stories of different people and all of which are given equal respect and voice. Despite the beautiful web that the authors weave, I did though find the sheer amount of different snapshots at times difficult to place and the book had the tendency to jump from one individual's story to another so quickly that I needed to read back the paragraph again to understand the context of the story. Hitler’s Last Day: Minute by Minute is a book that will surprise you, like it did me. Even though the subject of WWII can depress you and remind you of what people can do to each other, I came away feeling warmed. This book is not about Hitler but about humanity. What is refreshing in this book is the strength, equality and importance of everyone's voice regardless of their social standing or nationality, an example of which being, the importance and detail of a Russian teenage girl and her excitement of the US soldiers' arrival was shared with the same amount of importance as to what was taking place in Churchill's office. This books takes us through the minute by minute incidents happened over 3 days - 29th April, 30th April when Hitler commits suicide and the days after that. The narration includes the experiences from many people through interviews and diary entries who are fighting the war. Americans, English, Russians, Japanese and etc. The book also tells us the overall situation of second world war. Even though the character list is huge, we do not feel any disconnect between the pages. The timeline of even This books takes us through the minute by minute incidents happened over 3 days - 29th April, 30th April when Hitler commits suicide and the days after that. The narration includes the experiences from many people through interviews and diary entries who are fighting the war. Americans, English, Russians, Japanese and etc. The book also tells us the overall situation of second world war. Even though the character list is huge, we do not feel any disconnect between the pages. The timeline of events feels seamless while reading. One can feel the intensity of the war and its effects on millions of people by reading this and I cannot help but feel sorry for the victims who died in the name of war. The propaganda spread by the Nazi Germany had fooled the German citizens and I wonder do they regret about it looking back after 75 years. The allies of America, England and Russia did well in stopping the catastrophic regime under Hitler but the damage had already been done. Over 6 million Jews were killed 4 years between 1941 and 1945. When the allies inch closer hour-by-hour to capture Berlin, headquarters of Nazi government the German officers starts to panic and depend on Hitler for the course of action to be taken. 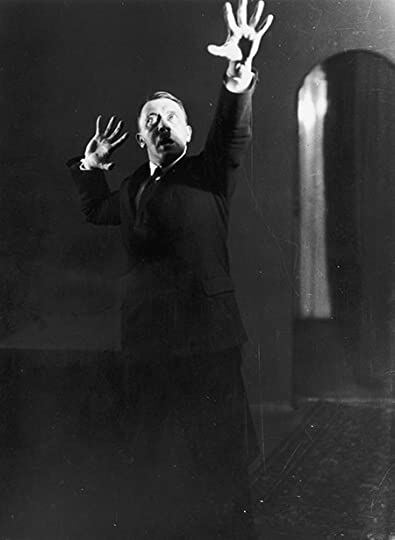 But Hitler still believed that he can defeat the allies and when he finally realizes that Berlin has fallen, he decides to take his own life and do not escape. 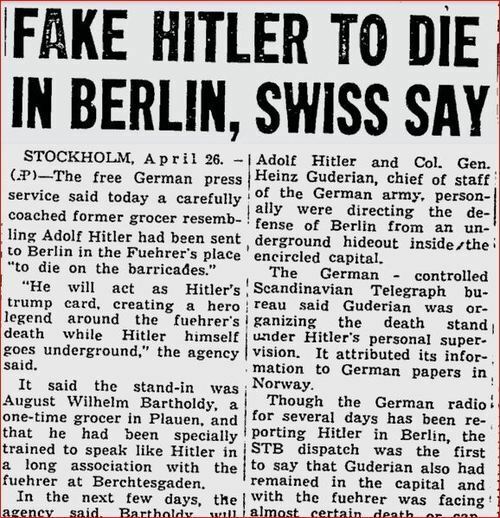 The followers of Hitler who were mesmerized by his charisma also decides to stay with him till the end and most of them commits suicide. My only complaint if I can use that word is the lack of pictures. There are 4 pictures in total which is not justified for the sheer importance of the book. 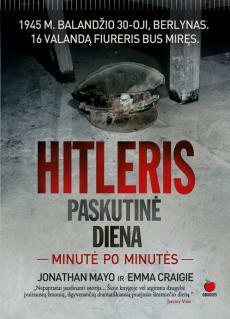 This is more than a book about Hitler and Eva and their deaths in the bunker. There are their staffs, and the Goebels family of course; but Mayo also dropped in what was going on in Burma and in the Pacific Theatre of war, the liberation of Dachau and other labour / punishment / interment camps, the initial meetings in San Francisco of what would become the United Nations, the diaries of war correspondents, soldiers, and the families waiting hopefully for the end of the war and the discharge of This is more than a book about Hitler and Eva and their deaths in the bunker. There are their staffs, and the Goebels family of course; but Mayo also dropped in what was going on in Burma and in the Pacific Theatre of war, the liberation of Dachau and other labour / punishment / interment camps, the initial meetings in San Francisco of what would become the United Nations, the diaries of war correspondents, soldiers, and the families waiting hopefully for the end of the war and the discharge of their soldier-boys. The things that occurred roughly at the time the Hitlers were getting married and preparing to die. Most readers are disappointed by the book's title. They thought it's going to be a detailed description of the very last moments of the Devil itself. Well, neither it's focused on Hitler nor 's set in one day frame. I recon Mayo had something more general in mind. Maybe we should understand the "Hitler's Last Day" as the end of the world terrorized by the Nazis? I loved this book. A real page-turner. An immense amount of research must have gone into this project. Exactly the kind of thing I like to read. A very in-depth and fascinating account. Felt like I was living those final hours. Amazing amount of research has gone into this book for the end result to be as it is. Rápido, conciso e excelente livro introdutório sobre o assunto. Straight off, I have to say that the title of this book is very misleading. In no way is this a minute-by-minute account of the Hitler’s last day. What it actually is an almost hourly account of the last two days, which is absolutely fine. I’m not complaining, just, you know, keep it real please writers. Whilst I find history, of all ages, fascinating, I confess to really struggling to get in to the whole who did what, when and why (and if you give me more than five German names to remember, I’m Straight off, I have to say that the title of this book is very misleading. In no way is this a minute-by-minute account of the Hitler’s last day. What it actually is an almost hourly account of the last two days, which is absolutely fine. I’m not complaining, just, you know, keep it real please writers. Whilst I find history, of all ages, fascinating, I confess to really struggling to get in to the whole who did what, when and why (and if you give me more than five German names to remember, I’m going start forgetting who is who). So, this isn’t really my kind of book. I read it knowing it would be good for me to reach for something out of my comfort zone. As a result it’s hard to review, because I can’t criticise it because it didn’t appeal to me. If it’s your kind of thing, you may feel differently; however, I doubt it. The issue with this particular book is mainly the fact it has very little to do with Hitler. Again, from the title, you would expect there to be far more about the last day (or even two days) in the bunker. But, no. Which again is fine, but you do end up feeling a little duped. There are a lot of asides, stories that don’t really run together, and things that make you think “huh, what’s the point of this?”. Yes, it’s important to get first hand accounts and it’s great to use diary entries, but there are times I felt like stuff was just shoved in as an attempt to say “look, we have real accounts” but it didn’t fit with the general vibe. In fact, on more than one occasion it got in the way of the actual flow of the other stories. Biografija, istorija, atsiminimai, išgyvenimai, vertinimai. Idomu. The title of Emma Craigie and Jonathan Mayo's excellent history, "Hitler's Last Day: Minute by Minute", is actually a misnomer. This book is not only the story of Adolf Hitler's final day of life, but the authors include many others, from Winston Churchill to a young reporter, John Kennedy, and many others whose lives were affected by Adolf Hitler and his war. He committed suicide in Berlin as the Russian troops were fighting in the city's streets, hours away from taking over his bunker. Hitler' The title of Emma Craigie and Jonathan Mayo's excellent history, "Hitler's Last Day: Minute by Minute", is actually a misnomer. This book is not only the story of Adolf Hitler's final day of life, but the authors include many others, from Winston Churchill to a young reporter, John Kennedy, and many others whose lives were affected by Adolf Hitler and his war. He committed suicide in Berlin as the Russian troops were fighting in the city's streets, hours away from taking over his bunker. Hitler's death cannot be told as a singular event and Craigie and Mayo bring plenty of others into the story. Wednesday, April 30, 1945 - ten days after Hitler's 56th birthday - was a busy day around the world. Harry Truman was just settling into an uneasy seat as president of the US. He had not been "used" by Franklin Roosevelt who seemed to see little reason to confide in his fourth vice-president. In fact, Truman was not told about the atomic bomb until 10 days after he assumed office on Roosevelt's death! In England, Winston Churchill and his advisers - both political and military - were winding down as the war itself wound down. Allied troops were invading Germany like a pincher movement and talk of the coming peace in Europe was centered on Germany's surrender and the threat of the Soviet Union in eastern Europe. The Pacific war was on and the 6-week Battle of Okinawa was still raging. However, in the Burmese capital of Rangoon - under Japanese control since 1942 - the Japanese surrendered the city to Allied forces. The nascent UN was meeting in San Francisco, trying to put together a post-WW2 world. These are just a few of the world-wide events Craigie and Mayo cover in their book. Also included are the Germans who were in the Berlin bunker or acting on Hitler's orders - and orders of those who saw the end of the Third Reich a bit more clearly. The title of this book is slightly confusing. If you think that it's all about Hitler's last day, then you'd be wrong. It's actually more like the last 48 hours, and not specifically about Hitler, but what happened across the world in that period of time. Consequently there are side trips to the Far East, to Russians fighting in Berlin, to British and American soldiers. To be fair however, the greater part of the book IS about the time in the bunker. It's well told and very easy to read. Unfortu The title of this book is slightly confusing. If you think that it's all about Hitler's last day, then you'd be wrong. It's actually more like the last 48 hours, and not specifically about Hitler, but what happened across the world in that period of time. Consequently there are side trips to the Far East, to Russians fighting in Berlin, to British and American soldiers. To be fair however, the greater part of the book IS about the time in the bunker. It's well told and very easy to read. Unfortunately because the authors have boxed themselves into a corner with the title, it all gets rather rushed at the end, with an uncomfortable addendum wrapping up the stories of the many others involved in the book. Naming the book "WWII: The last 48 hours" or something along those lines would be so much more appropriate. If you picked this book because you have an interest in Hitler, you might just give it a pass. If you want a "minute by minute" review of what happened the last few days with a bunch of side stories, then you might like it. Emphasis on the might. A very interesting juxtaposition of accounts of events on 30th April 1945 as the Allies pushed into Germany, the war in the Far East was starting to turn and in Berlin Hitler spent his last day in the bunker. An absolutely cracking read, both enlightening and emotional, by the time I had finished I wanted more. An absolutely brilliantly book , thought provoking and a must for anyone interested in second world war history. Pulls a number a threads together - some I already knew and some new - into and interesting picture of what was happening on the last day of Hitler's life. Jonathan Mayo joined the BBC in 1987, first working in radio and then television, where he won awards for his documentaries. In 2011 he became a freelance producer, director, and writer. He is the author of The JFK Assassination: Minute by Minute (Short Books, 2013). He lives in Surrey with his wife and son.